It is the late 1930s and the world is in turmoil. But the spirit of adventure and freedom won’t be stamped out so easily. Flying Frog Games neatly sidestepped the IP lawyers with this big-box Indiana Jones pulp adventure game—but you have to admire the chutzpah of calling it Fortune and Glory after a Temple of Doom line! 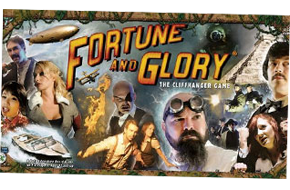 Fortune and Glory: The Cliffhanger Game is a fast-paced game of high adventure, vile villains, edge-of-your-seat danger, and cliffhanger pulp movie action. Players take on the role of a treasure hunter, traveling the globe in search of ancient artifacts and fending off danger and villains at every turn in a quest for the ultimate reward of fortune and glory. Gamers have been looking for the definitive Indiana Jones game for some time now, and this unlicensed but, let’s face it, shamelessly ‘inspired by’, take on the 1930s archaeology-and-adventure genre is the closest thing to it so far. You might be beaten by a Deep Sea Diving card, in which case next turn you’ll have to face a Giant Squid Attack. Like most Flying Frog Games, Fortune and Glory can be played either competitively or cooperatively. If you’re playing competitively, players take on the roles of various sterotypical characters—for example the nightclub singer Vanessa Love, martial artist Li Mei Chen, Jake Zane the flying ace, or Duke Dudley the British Lord—travelling across a map of the world in a race for Fortune and Glory. Cooperative play sees the players working together to undo the dastardly plans of some vile and shadowy organisation like the Nazis or the Chicago Mob, whose minions are played by the game itself. Four artifacts start scattered across the world and the heroes have to hunt them down and overcome Dangers to get their hands on them. Once they have done so, they can take them back to a city to sell them for Fortune; and the player with the most Fortune wins. These artifacts are made up of an Adventure and an Artifact card, so there’s a lot of variety in the possible combinations of artifacts. Once the adventurer arrives at a location where there is an artifact, there are dangers to be faced. These are drawn from a deck, and players may have to fight, or perhaps use cunning, to overcome the obstacle, making a number of dice rolls based on their character stats. Once a danger is overcome, the player can take the Glory listed on the card, or press his or her luck and continue to face the other dangers—but if a danger triumphs, you lose all your accumulated Glory. This is the ‘Cliffhanger Game’ after all however, and if a danger beats you, you flip the card to discover the Cliffhanger. For example, you might be beaten by a Deep Sea Diving card, in which case your turn ends with a Giant Squid Attack—which you’ll have to face on your next turn! If you love pulp adventure and Indiana Jones movies like me, you’ll grab this. And it comes in a box double the size of previous Flying Frog offerings, including 39 plastic miniatures: heroes, villains, enemy soldiers, Mayan temples, and even a zeppelin. Great, silly, thematic fun which has nothing too new rules-wise but is still a blast with the right players.